The percentage of market share taken up by the largest firms. 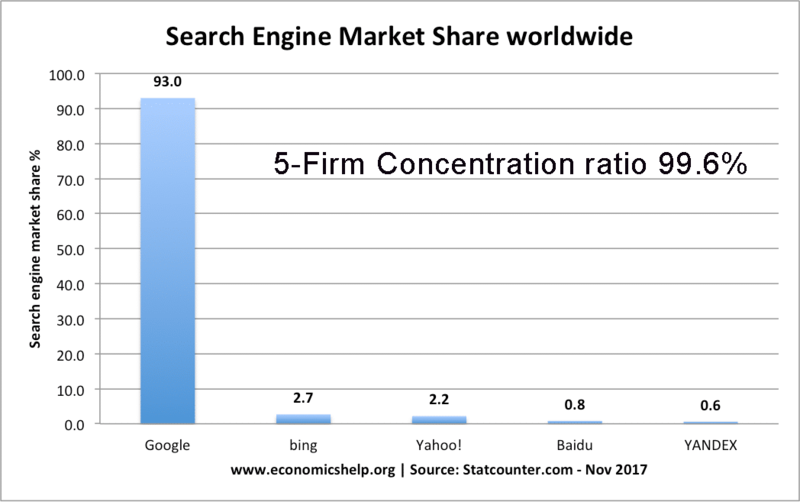 It could be a 3 firm concentration ratio (market share of 3 biggest) or a 5 firm concentration ratio. Indicate monopoly power. 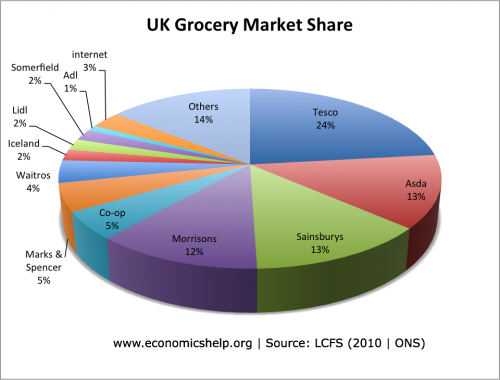 In the UK, the legal definition of a monopoly is a firm with more than 25% market share. Any firm over this threshold has an important market position. Regulatory oversight. If there is a three-firm concentration ratio of over 80%, then there is greater scope for collusion and abuse of monopoly power. In this kind of industries, the government may need to use a regulator to check monopoly power isn’t being abused. For example, the government has a regulator for railways, electricity and gas – where the market is dominated by a few small firms. One feature of concentration ratios is that they do not indicate the level of contestability. A contestable market has freedom of entry and exit. The threat of competition is sufficient to keep prices low – even if the concentration ratio is quite high. 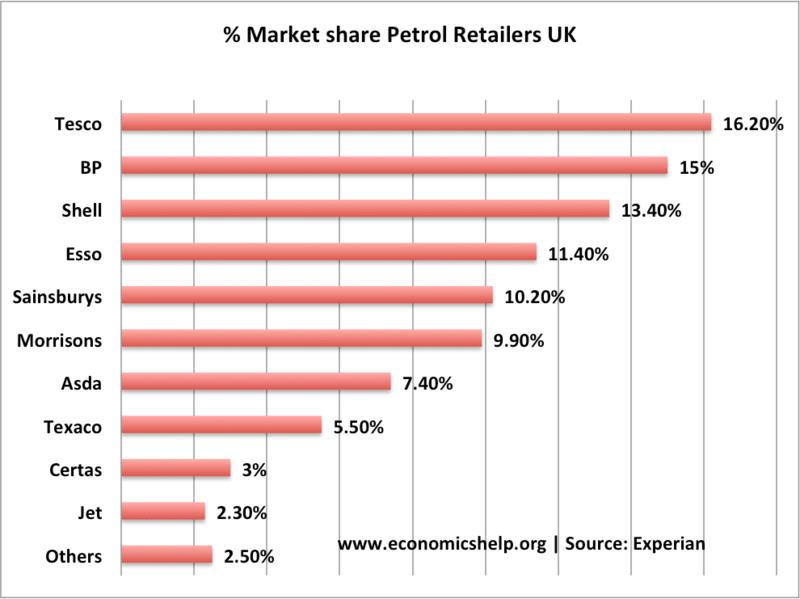 The growth of supermarkets selling petrol has made the market more competitive – especially because supermarkets are willing to sell petrol at a competitive pressure to attract customers to shop at the supermarket. 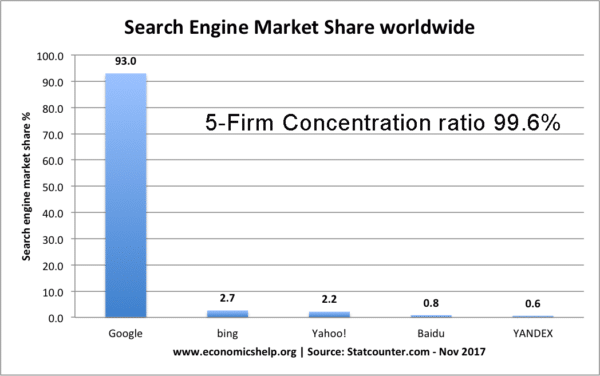 Note: I have seen other measures which put Google on closer to 80% of market share. This is from Statcounter.com own aggregate statistics. The five firm concentration ratio for the industry is 66% – a case of an oligopoly.